Imagine your piano played by Rachmaninoff, Horowitz or Rubinstein who are some of the greatest artists the world has known. Imagine it playing Broadway show tunes, classical, jazz improvisations or ragtime or all of your favorite music. Imagine your piano setting the stage for every occasion from dinner for two to a houseful of company. Imagine it playing the perfect musical selections as vividly as if the artists were performing them right before your eyes. Imagine PianoDisc. 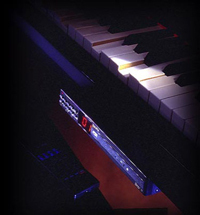 Itís important to remember that all PianoDisc systems feature full 88-note playback with 127 levels of expression per key and all PianoDisc systems feature SilentDrive, PianoDiscís exclusive, patented technology that allows the piano to play with greater dynamic range including whisper and soft levels. These important built-in features ensure that PianoDisc systems play your piano like the original artists’ lifelike, full of expression and musical, not mechanical. These are 21st century player systems, not the player pianos of old.